How can traveling with kids become easier? Every parent knows that travel with kids is a whole different ballgame than travel as a couple or with other adults. From managing an extended packing list, planning around nap times and mapping out where to take potty breaks while on the road, there are a ton of extra considerations that can make or break your family vacation. One of the more difficult aspects of traveling with children is where to stay. Traditional hotel rooms are not particularly family friendly, as anyone who has tried to squeeze four (or more!) people into a room that is really designed for two. Even while some hotels have conveniences like mini-fridges, sharing a tiny bathroom and having to turn the lights out at 7pm so as not to disturb young sleepers is not anyone's idea of a fun family trip. If your family is larger in size, you may have to book multiple hotel rooms, splitting the adults across them so that there is adequate adult supervision. What was supposed to be a vacation turns into a lot more work in planning and juggling. ​Enter the kid-friendly vacation rental home. With an Atlantic Vacation Homes vacation rental, your family can stretch out and enjoy the amenities of an entire home. The kitchen in Granite Pier is roomy enough for the whole family to gather. With so many property types to choose from, you can opt for as many bedrooms and bathrooms as you need, in the location that is most convenient. Whether you want a vacation home that is close to downtown shops and dining, a a vacation home directly on the water or a rental that comes with a separate suite for a nanny or in-laws, we have a variety of homes that can meet every need. We also have pet-friendly vacation rental homes, ensuring that your family pet can also join in the vacation fun. You can cook meals in a real kitchen, saving money on dining out. You can do laundry, allowing you to pack less and treat accidental spills or stains when it's convenient for you to do so. Staying in a residential neighborhood lets you live like a local. The extra space means family togetherness when you want it, and privacy when you don't. Kids will like a twin room with a view at The Rockporter (L) and bunk beds make sleeping fun at Family Tides (R). 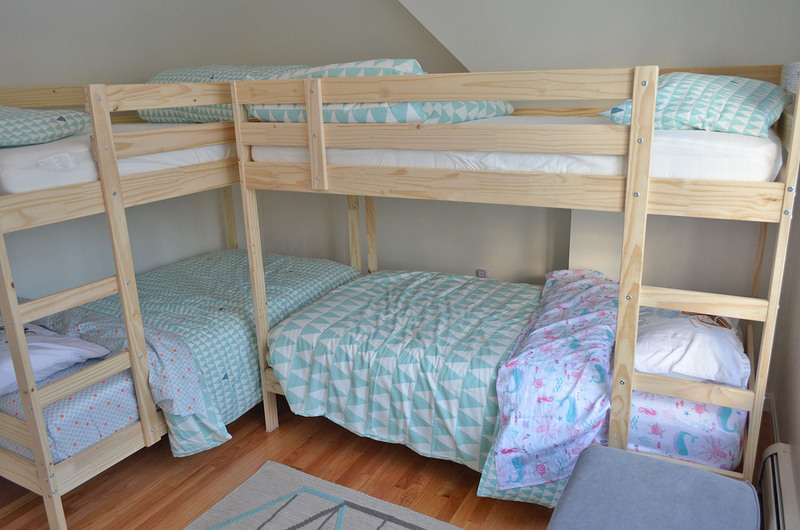 Many of our vacation rentals have kid-friendly furnishings, such as twin beds or bunk beds and most come already equipped with "rainy day" supplies of board games, books, cards, and toys. Every home has at least one living area, and many have additional spaces like dining rooms, dens or rec rooms. Strawberry Cove House has a game room with a ping-pong table -- fun for kids and adults alike. 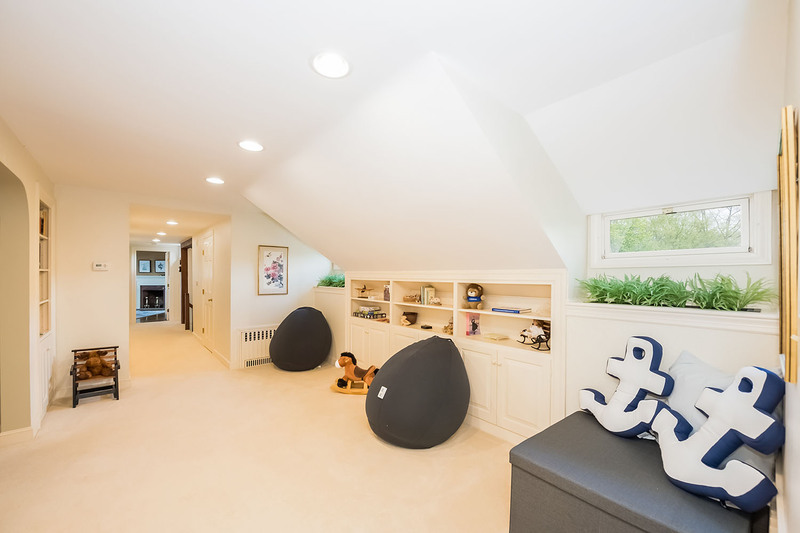 Grandview has kid-friendly nook with books and toys. Vacation rentals are the ideal type of lodging for those who travel with kids, whether it's just a small family unit or multiple generations coming together for a family reunion. A vacation rental home offers value, convenience and a unique and memorable home base from which to launch the vacation of a lifetime. So what are you waiting for? Plan your next family vacation to Boston's North Shore with Atlantic Vacation Homes. Book your best family vacation today! Everybody loves the swing set at Long Beach House.